What is scroll engagement behavior? Scroll engagement behavior refers to when a user scrolls down the page on a website or app in a smooth, regular rhythm, signifying the consumption of content. This is an especially familiar behavior for those of us who read articles on our mobile phones on public transport, thumbs raking screens. Why is scroll engagement behavior important? Scroll engagement behavior is an important metric for measuring how people are engaging with content. Looking at 6 million sessions across a major media site, our data scientists analyzed scroll engagement in relation to the number of goals completed by users. Within Decibel Insight, goals are triggered when a user completes a desirable action during their session. For the particular media website we looked at, goals are configured to trigger when users fill out a form, hit a call-to-action, or visit the paid subscription area of the website. Our data scientists found that user sessions containing scroll engagement behavior completed an average of 1.01 goals. Average user sessions, by contrast, completed just 0.31 goals. Scroll engagement is also a useful metric for compliance purposes. A Decibel Insight financial services client, for instance, uses scroll engagement in conjunction with scroll reach to ensure its customers are fully aware of and have consumed its regulatory compliance requirements. 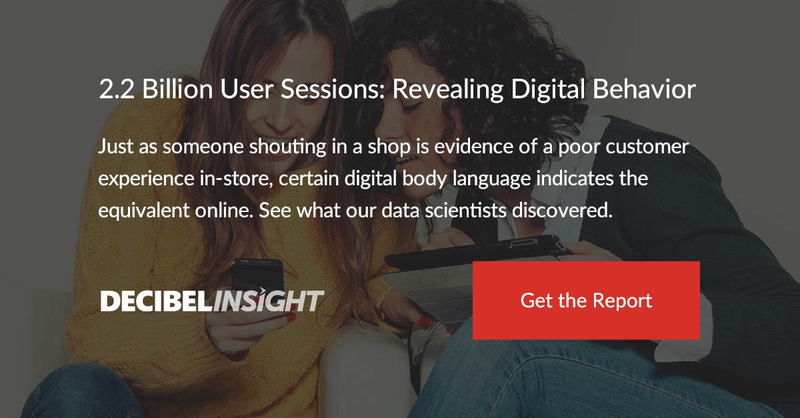 To learn more about scroll engagement behavior - and other digital behaviors that denote user sentiment - download our full report on digital body language below.